Table of Contents Next: Emmons, Delos C.
Emirau (149.97E 1.65S) is located about 90 miles northwest of Kavieng in the St. Matthias group. The island is irregularly shaped but about 8 miles (13 km) long and between 2 and 4.5 miles (3 and 7 km) wide. Most of the island is a plateau ending in cliffs dropping 75' to 185' (23 to 56 meters) to the coastal plain, which is a few hundred meters wide and consists of mangrove swamps along much of the southern coast. Most of the coast was fringed with reefs, but there were decent anchorages at Hamburg Bay and Eulolou. The island was covered with a mixture of light vegetation and jungle. The island was completely undeveloped prior to the war, with a single track along its length with a spur into the northern peninsula and a maze of trails in its western portion, and the Japanese presence was limited to a few coast watchers who were withdrawn by January 1944. On 12 March 1944 the Joint Chiefs of Staff, on advice from Nimitz, canceled the invasion of Kavieng. Nimitz believed that the AIRSOLS campaign against Rabaul had made such a move unnecessary. However, the amphibious force for the invasion had already been assembled by Halsey at Guadalcanal, and two days later he ordered Wilkinson to take Emirau instead. Griffin took his old battleships, New Mexico, Mississippi, Tennessee, and Idaho, to bombard Kavieng on 20 March, which proved an effective diversion. Simultaneously 4 Marine Regiment occupied Emirau without opposition, landing 3,727 men across beaches on the southeast end of the island. At the same time, the nearby Japanese seaplane base on Eloaue Islet, off the south shore of of Mussau Island to the northwest, was shelled by destroyers and put out of action. 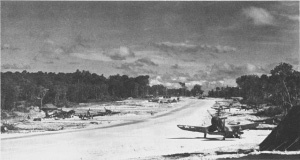 Within a month 18,000 men and 44,000 tons of supplies had come ashore and a PT base had been established, and in early May the first airstrip was completed. Eventually the island had two 7000' (2130 meter) runways on the northern peninsula.